Irish Echo reports that Australia's 7 Network has made a decision not to look for the rights to screen Gaelic games because it was not making enough profit. 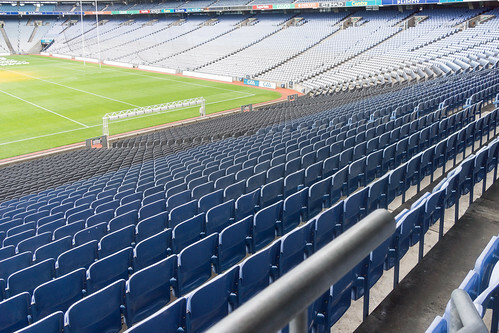 Ex pats and all GAA fans will have to find another way to get their fix of football and hurling after the Seven Network decided not to screen matches in 2015. In a report in the Irish Echo Newspaper, the network states that the decision was made because the numbers were not adding up for them. Last year over 40 matches were made available to audiences 'Down Under' after Seven decided to look for the rights to screen them. However, the Irish Echo report adds that this was just an experiment by way of a one-year rights deal and that it had not made plans to do the same in 2015. Speaking on the matter to the Irish Echo, an insider said it was just an experiment and viewing figures and scheduling changes made it impossible to repeat for this year. Perth commuters are to get a new app to help them negotiate traffic snarls and city construction works. Transport Minister, Troy Buswell was on hand to launch the new app (Right Move Perth) that is available for download on IOS and Android platforms. He said that the State Government was listening to the concerns of road and transport users. “Perth is going through a significant period of transformation, with major infrastructure projects like the Perth City Link and Elizabeth Quay well under way, and necessary road works to support our growing State,” Mr Buswell said. The smartphone app, available for download now, will give access to real-time information on incidents and road conditions around the metropolitan area, helping commuters avoid congested areas and better plan their journeys. The app will give information on road works, crashes, traffic signal faults, train and bus service disruptions, major events, project information and weather warnings to help plan journeys. Users can save favourite routes and then they will be notified of any incidents within a one kilometre radius of these routes, no matter where they are in the metropolitan area. The Government say that they are committed to keeping Perth moving and this new technology is a timely reminder that from today a 300m section of Riverside Drive from the Bell Tower to the Convention Centre will be permanently diverted to alternative routes. Information about the new Riverside Drive diversion route is available on the Main Roads website http://www.mainroads.wa.gov.au or via the 24-hour Customer Information Centre on 138 138. For public transport users, Transperth has also launched a smartphone app, which is free to download and available on Apple and Android devices. The Transperth app enables users to find next services from any stop, station or jetty, plan their journey, view fare information and access their SmartRider balance. World championship, silver medalist javelin thrower, Kim Mickle, has been named the Western Australian Institute of Sport (WAIS) Athlete of the Year. Sport and Recreation Minister, Terry Waldron presented the award at the WAIS Annual Dinner last night. The award caps off a stellar year for the WA athlete who won a silver medal at the 2013 IAAF World Athletics Championships in Moscow and took home her eighth national title in April. During the function, the minister also elevated Ric Charlesworth - former captain of both the Australian and state hockey teams as well as the state cricket team - to legend status in the WA Hall of Champions. Minister Waldron congratulated both Kim and Ric and all the other winners on the night. “The State Government is proud to be a major supporter of WAIS and we’re thrilled that these athletes have been awarded for excellence in their sport. These winners set the bar high and I know will offer inspiration to all the other athletes working their way towards Glasgow and Rio,” the Minister said. WAIS Coach of the Year Award: Grant Ward (athletics). Water polo player Danielle Woodhouse was also inducted into the WA Hall of Champions after playing 154 games for Australia between 1993 and 2000. WA's Police Force has taken delivery of a second state-of-the-art armoured rescue vehicle for use in emergency situations. The Bearcat (Ballistic Engineered Armoured Response Counter Attack Truck) is a multi-purpose rescue vehicle that will be used by the force's Tactical Response Group (TRG). Police Minister Liza Harvey said the armoured rescue vehicle would increase the force's capacity to respond to hostile and armed offender incidents. Mrs Harvey said the delivery of the second Bearcat was in line with the State Government’s drive to ensure WA Police were provided with the most modern equipment possible. “This is the second armoured rescue vehicle, and It will assist with the recovery and protection of civilians during terrorist threats, hostage incidents or encounters with armed offenders. “It’s an important and significant police asset and is another step towards making WA Police one of the most modern policing jurisdictions in Australia," she said. The minister added that by making WA Police one of the most modern forces, she hoped that in turn it would help to attract the best possible people to join the force. She said the Bearcat would complement other hi-tech equipment provided to the police by the State Government. The list of supplied equipment includes 48 advanced traffic management vehicles costing nearly $4m and a hi-tech helicopter costing $20m. “In addition, we provided $1.3m for two high-capacity police transport vehicles designed to assist in the management of out-of-control parties," the Minister said. Mrs Harvey said the TRG had been using the first Bearcat in a variety of situations since 2007 when it was purchased by the State Government. This second vehicle was purchased by the Federal Government through the Australia-New Zealand Counter Terrorism Committee. The City of Perth is to play host to the largest resouce event in its history, the Liquified Natural Gas (LGN) Conference in 2016. This week the Mines and Petroleum Minister, Bill Marmion is in Texas in the US, where he will address 10,000 delegates at the closing stages of this this year's LNG Conference. After the Minister delivers his address the organisers, Houston, will pass on the hosting duties for the next conference in 2016 to Western Australia. Seen as the largest resources event in its history, it is anticipated to inject more than $50million into the State’s economy. countries to attend the eighteenth LGN conference in Perth 2016.
production and services companies from the USA, Europe and Asia. The LNG17 conference runs from the 16-19 April.